These stained glass windows were created expressly for the exhibition ‘art in the streets. ’ They were completed with students from the city of angels public school in los angeles. The artist erected panels in the schoolyard and requested that they be tagged for source material. The resulting boards were placed behind a medieval silhouette, rendering what looks like a stained glass window. 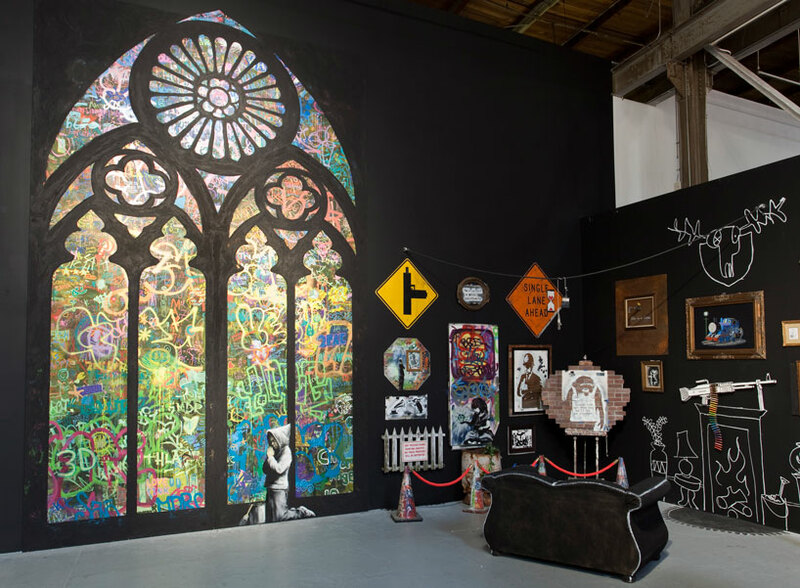 The kneeling figure in front draws extra light to emphasize the conversion of museum to a church as well as the elevation of graffiti to high art. ‘stained window,’ installation view image by brian forrest, courtesy of MOCA. His blog is over here. Its rather old but the oil work is rather good, better than what MOCA commissioned with public funds I should add.